The Persian Empire arose in the ancient country of the Iranian Plateau. 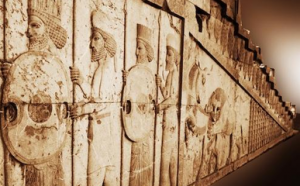 The Persians belonged to a branch of the Indo-European language family. They moved from Central Asia to the southwest of the Iranian Plateau (Fars region) in the late 2000s BC. There were ten tribes (six farming and four animal husbandry). Once under the rule of Medes. The word Persia has been used for centuries, mainly in the West, to indicate a region of southern Iran that was formerly known as “Persis” and “Parsa”.Click Here For More. During the Elam and Medes period (2700-550 years ago), Elam and Midi were not called Persia by Greeks, but they were an indispensable part of the history of the Persian region. The Medes, who belong to the Indo-European language family with Persians, settled in the northwest of the Iranian Plateau. The Persians came to the Iranian Plateau with the Medes. They settled in the southwestern part of the Iranian Plateau near the Persian Gulf. The Persians had ten tribes, six of which were engaged in agriculture and four in animal husbandry. Ancient Persia is a typical example of the eastern autocracy. During the Empire period, slavery economy in Western Asia was further developed. Persian culture was mostly influenced by the culture of the Mesopotamia, using cuneiform characters, and plastic arts had higher achievements. The founders of the Persian Empire easily unified the Levant region politically within 25 years (about 550-525 B.C.) and took vigorous measures to achieve the peace and order it desperately needed.